Everybody has a vivid memory of Santa Claus, some might even have met him, as I have in Rovaniemi. What about Mrs. Santa Claus? Well, I have met her too. Almost exactly 700 km north of Rovaniemi and the Santa Claus Village, you find the northernmost fishing village in the world, Skarsvåg. For the connoisseur traveler, Skarsvåg is a gem. In fact, Skarsvåg was an important part of the infancy of tourism at North Cape. Early cruise ships found a safe harbour in Skarsvåg starting in 1934, when the breakwaters were built. Many of the idyllic houses in this small village are built just after WWII. In the Autumn of 1944, all buildings were put on fire. The reconstruction of the village was a success in 1951. The independent people of this area added personal touches to their bureaucratically designed houses. And, if you can spot two houses with identical colours, please send me a picture to prove it. Colour, buildings and artistry will be the theme of other blog posts. At 71 degrees north, roses do not grow wild. Perhaps, to show cruise people that Skarsvåg was a nice place: Blossoming small gardens were maintained? Not until 1956 could you drive to Skarsvåg. It is after all a fishing village, and transportation had always been on salty water. In a challenging maritime environment, the sea is abundant with one of the top stocks of fish in the world. Skarsvåg is one of these fishing villages that allow the fishermen to go fishing, and most importantly, return quickly and safely after fishing. Anyway, a few years back, I came in my Toyota to Skarsvåg with a blogging colleague, Sveta from Russia. Entering the village, a reindeer buck was strolling along the road. I stop, the reindeer is put on film: Sveta says “Super”. I stop at the tourist centre, a young boy holds up a moving king crab for Sveta’s camera: Sveta says “Super”. Finally, I stop at the Christmas and Winter House. Nobody. It is July, outside is a garden my mother would love. Inside, we can smell the gluewine, and there are Santa Clauses in all different shapes and forms. Postcards, reindeer and other Christmas things are displayed on the shelves. After a few minutes, here comes Mrs. Santa Claus. She has been busy all day, and is now cooking fish soup. Some Dutch guests are on their way. She offers us a cup of coffee and waffles with strawberry jam. Sveta takes a picture of the beautifully ornamented plate. We talk with Mrs. Santa for a while and leave just before the new guests come knocking. We buckle up, and before we head south: Sveta says “Super”. 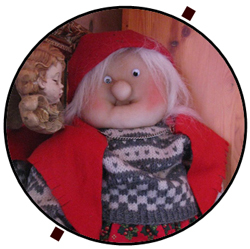 Have you met Mrs. Santa Claus in Skarsvåg?